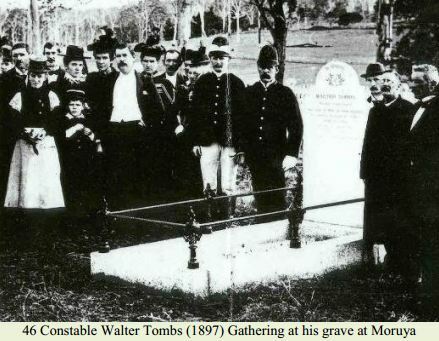 Shortly after 9am on 25 November, 1897 Constable Tombs led a troop horse from the police stables at Moruya to travel on patrol to Pedro Point. The horse, on loan from Braidwood Police, was known as a rogue and when the constable stepped into the saddle the horse began to run backwards. 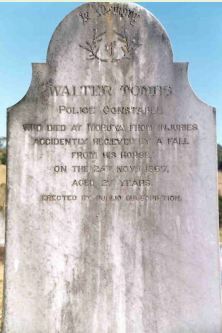 Despite Constable Tombs attempts to control the horse it fell, landing on top of him. The horse then regained its feet and began to kick out at the constable who was hanging from the stirrups. When Constable Tombs fell to the roadway the horse ran off. Local people then came to the constable’s assistance and he was taken to Senior Sergeant Henry Bragga’s residence where he was attended to by Dr John Quilter. A short time later he was taken home, however he passed away about midday. 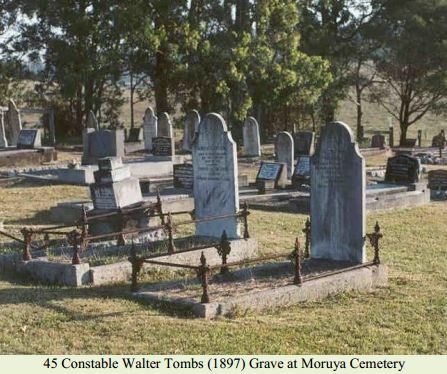 The cause of death was later found by a coroner’s jury to have been “from the effects of injuries accidentally received on 25th November, 1897, in Moruya, through his horse falling upon and kicking him” causing effusion of blood on the brain. He was buried at Moruya. The constable was born in London in 1870 and joined the New South Wales Police Force on 7 April, 1894. At the time of his death he was stationed at Moruya.